Thanks to our fantastic supporters, solar lights are arriving in emergency camps in Southern Malawi today. 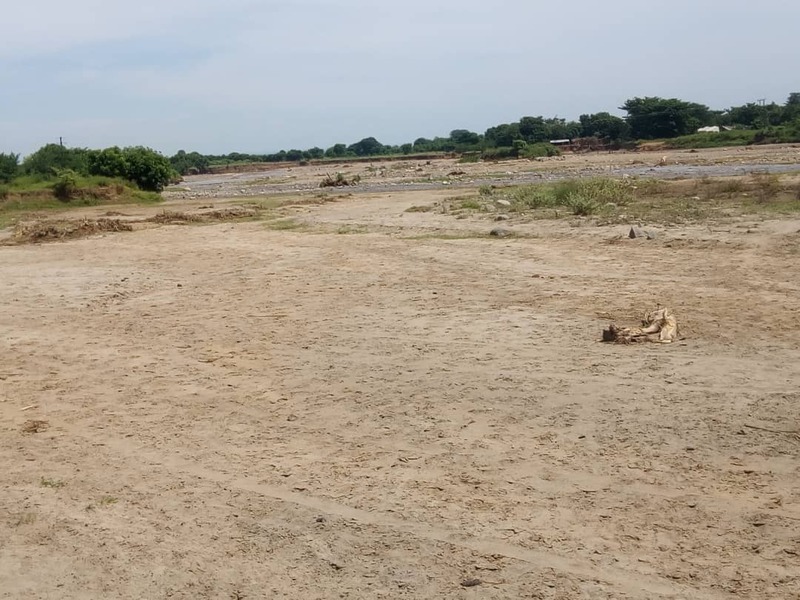 Just over two weeks ago, Cyclone Idai struck Mozambique and Zimbabwe and caused extreme rainfall, flooding and high winds in Malawi. In Malawi, the tropical cyclone has now forced over 86,000 people in 15 districts to leave their homes, and has reportedly taken the lives of 59 people. Brave Mhonie, who leads SunnyMoney in Malawi, went to see how we could help. Newborn baby, Grace, in Chikuse Camp, Malawi. As the sun was setting on Chikuse Camp, Brave met Grace. Grace was just two days old and is one of the first babies to be born in the emergency camps across Malawi. 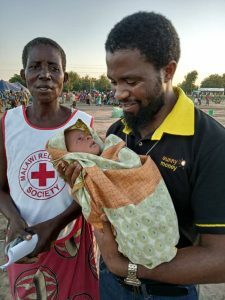 In an article in Malawi’s newspaper, The Daily Times, it is estimated that she is one of 12,000 babies that will begin life in an emergency camp. 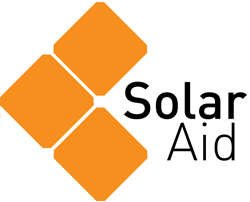 At SolarAid, we don’t normally run emergency response appeals, but as the only major distributor of solar lights in Malawi, we wanted to see how light could help families in the immediate relief effort. Hearing from our SunnyMoney staff and sales agents about the devastation in Southern Malawi, we decided to act. 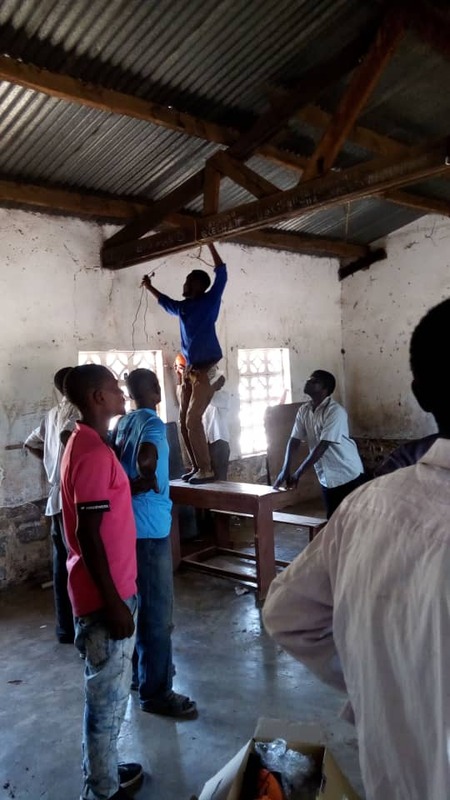 We then engaged with the local authorities and the Malawi Red Cross to develop a distribution plan and ensure that the lights have the greatest level of impact. We also sent out our email appeal to supporters. 100 solar home systems: These homes systems have three solar lighting points and can charge mobile phones. These are being installed in the main communal areas of the camps to increase safety and comfort. In camps using pre-existing buildings, such as schools, the solar home systems will be installed permanently. In camps using temporary structures, the Malawi Red Cross will be able to use the lights where they are needed most in the future. 100 portable solar lights: These lights have been given to camps with women’s sections to increase safety and enable them to care for their small children. 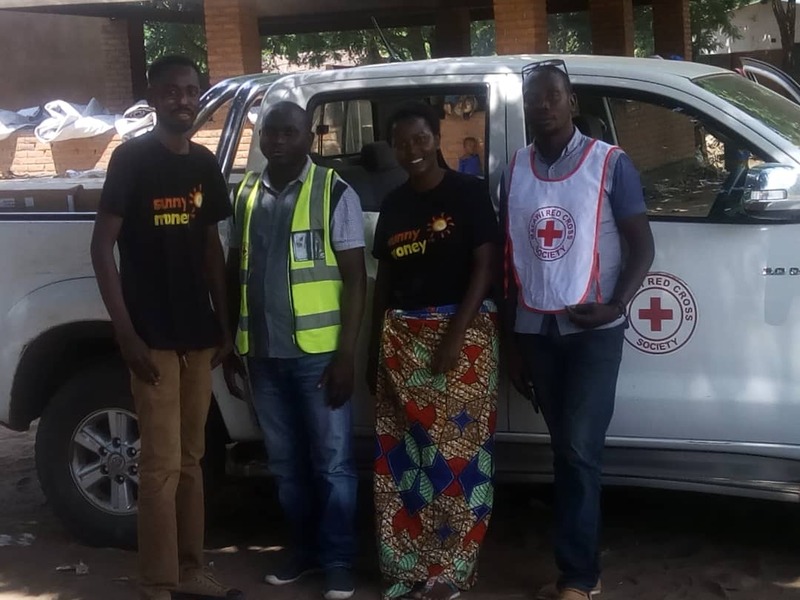 Our SunnyMoney team arriving with the Malawi Red Cross to deliver solar lights to Nyangu Camp. The generosity of our supporters has enabled solar lights to be installed and delivered across 35 emergency camps in Southern Malawi today. Women will be safer: Using the portable solar lights, women will feel more comfortable walking to the toilets after dark. Children will go to bed less frightened: When heavy rainfall comes during the night, families in temporary shelter sometimes need to move quickly. With access to light, this is much less dangerous and traumatic for young children. People will be able to charge their phones: People in the camps can charge their mobile phones from the solar home systems, enabling them to stay in touch with family and friends during these challenging times. Families will be better able to look after their children at night: The nappies of young children and babies can be changed easily and hygienically under solar light. The risk from dangerous animals will be reduced: Many of the camps are surrounded by thick bush – with solar lights, families are able to see snakes and dangerous insects and the risk of being bitten is much lower. Installing a solar home system in a women’s dormitory. Thank you for helping us respond to the Cyclone Idai emergency. Since launching the appeal, we have been overwhelmed by the response from SolarAid supporters. Following our email in less than two weeks, you have raised the funds needed to light up 35 emergency camps in Malawi. Thanks to your quick and generous response, at this point we are no longer seeking further donations. We will, however, continue to offer technical advice to the Malawian Red Cross to help ensure the solar lights continue to serve the camps and support the amazing work being carried out. While we are not appealing for more funds right now, our work here is not done. Unfortunately, this will not be that last climate disaster to hit Malawi. This is climate injustice in action – those who are least responsible for rising carbon emissions are being hit the hardest. We are now in discussions with The Malawi Red Cross about a long-term strategic partnership that would see us working together to ensure people have access to light in these times of extreme darkness. Floods washed away whole fields of crops. This is climate change, climate injustice, in action. Hitting those who did not create the problem, the hardest. For baby Grace, Chikuse Emergency Camp is the only world she’s ever known. Your support in this appeal has helped to create a brighter future for Grace and many others in these camps.